But before we take a look at these before and afters, we’re going to give you a bit of advice on how you can transform your yard, just like they did. A good tip to start with -- when giving your yard a refresh, do all of your hardscaping projects before you set out any plants. The construction involved with these types of projects can compact your soil or damage turf and plantings, so it’s a good idea to do all the heavy work before you start planting. When choosing hardscape materials, remember that “research really pays off, especially when you consider that a fixed object in the landscape is not going to move easily — and you don't want to put in a lot of effort and then have your materials or design fail within a couple of years," says landscape designer Samuel Salsbury. 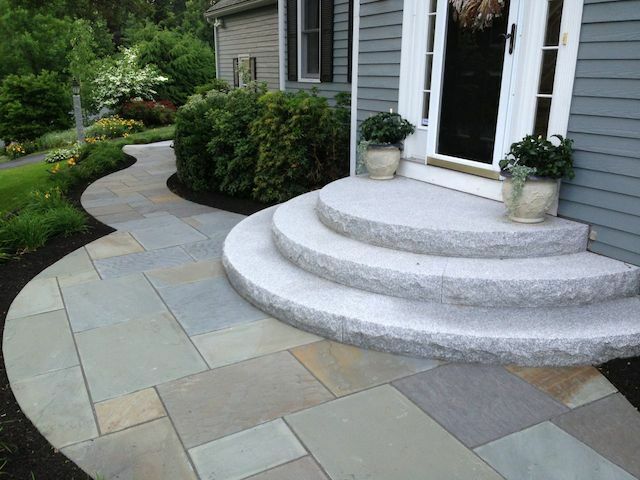 If you’re going with natural stone, whether it’s a set of new granite steps, a walkway, patio, driveway or garden edging, Swenson Granite Works has you covered. Natural stone like granite is a durable option that consistently outperforms wood, brick and concrete. It’s also virtually maintenance free, naturally durable and lasts for generations.  You can visit a Swenson Granite store near you and we will help you choose the right stone for your project. Although natural stone will dramatically improve the appearance of your yard, a lush green lawn is quintessential to a fresh and polished look. An electric lawn mower will help you keep your lawn looking sharp. When your lawn is not lush and healthy, it’s time to investigate. “The first step toward deciding whether to slowly rehab your lawn or start over is figuring out why your lawn is failing,” says Wendy Wilber, an environmental horticulture agent. It could be a problem with soil pH, lack of sunlight, or a drainage issue that might make growing grass difficult or impossible. Your lawn could also be compacted, making it hard for roots to get air and water. Constant foot traffic can also turn soil as hard as pavement. “If yours is just a lawn gone bad due to neglect, then maybe lawn renovation is the way to go,” says Wilber. If more than half of your grass has weeds or bare spots, she suggests you completely redo your lawn. Let’s take a look at what happens when you take these helpful tips into consideration. This front entrance was given some much needed TLC. These were concrete blocks glued together and filled with stone dust (which was starting to come out). The homeowner was ready for a serious upgrade to liven up the entry. Woodbury Gray granite rock face radius steps and a winding full color bluestone walkway lined with shrubs and plants bring such elegance to this front entrance. 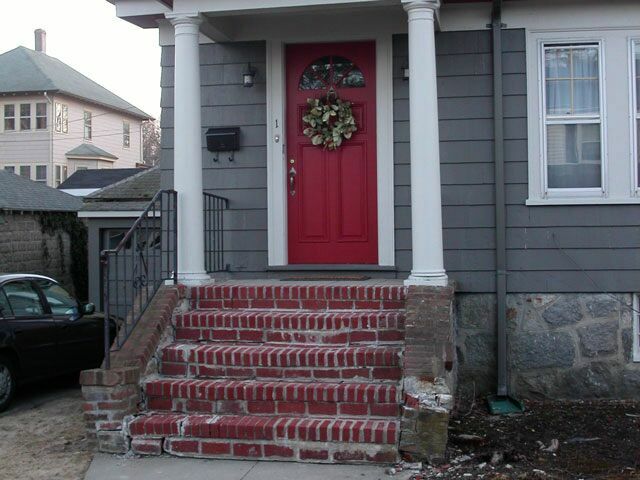 The homeowners wanted to completely transform this front entrance, and they started by ditching the old dilapidated brick steps -- both an eyesore and a safety hazard. 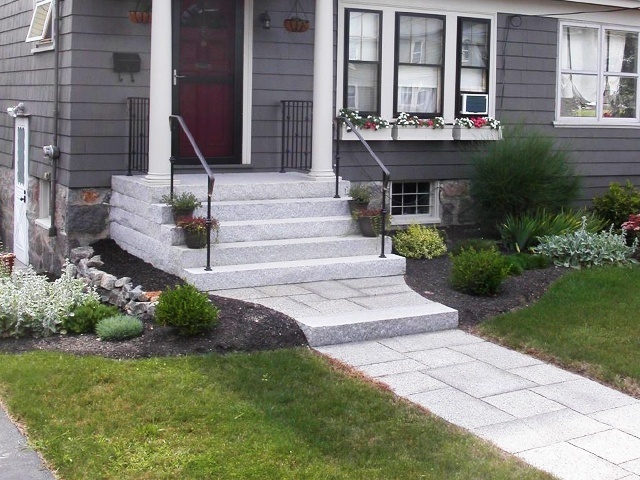 An uninviting front entry is transformed and brought to life with Woodbury Gray granite steps, a Caledonia granite walkway, plants, shrubs, green grass and window boxes. These decayed timbers were neither functional nor attractive. The steps start from the backyard and lead to up to an old tennis court and play area that the homeowners wished to use again. 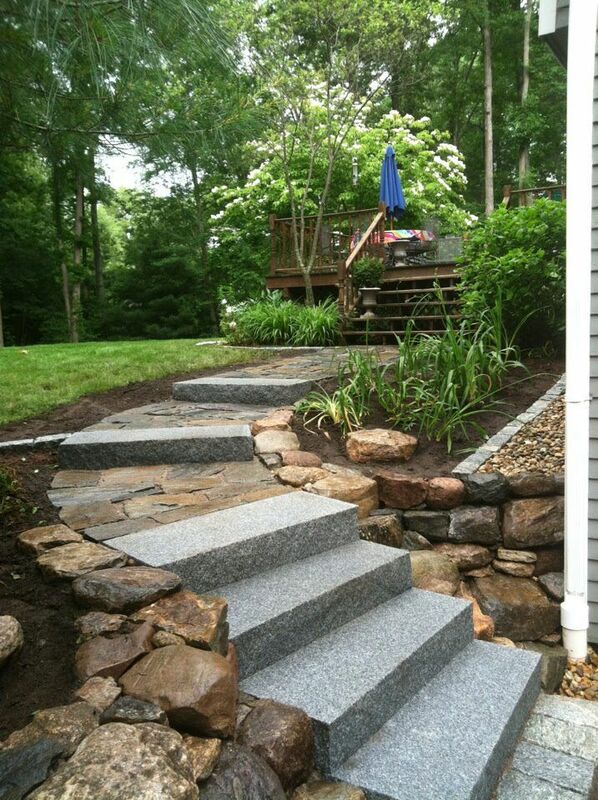 After working through some tough tree roots, the 36 x 18 inch Woodbury Gray granite split face steps were installed and a wall built on both sides. Beautiful greenery livens up the surrounding space. 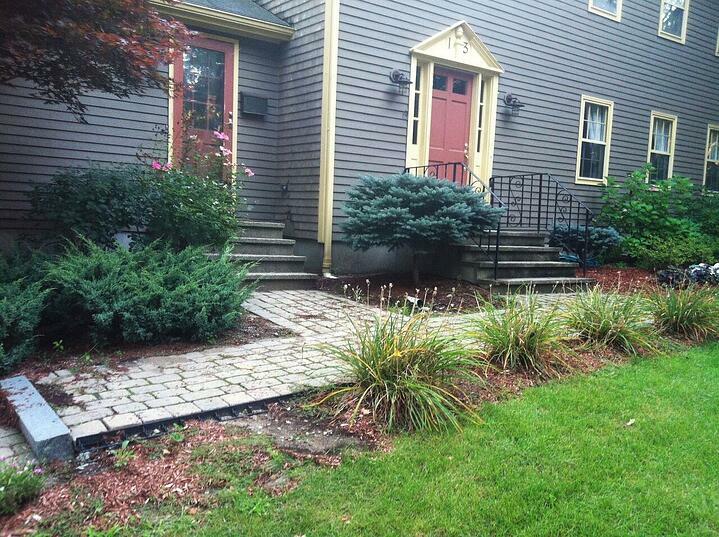 The homeowners decided it was time to transform these two front entrances with natural stone. 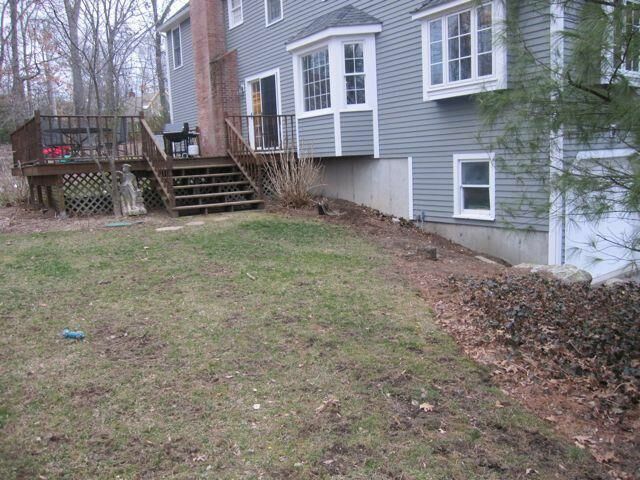 They happily parted with the brick walkway and both sets of concrete steps. 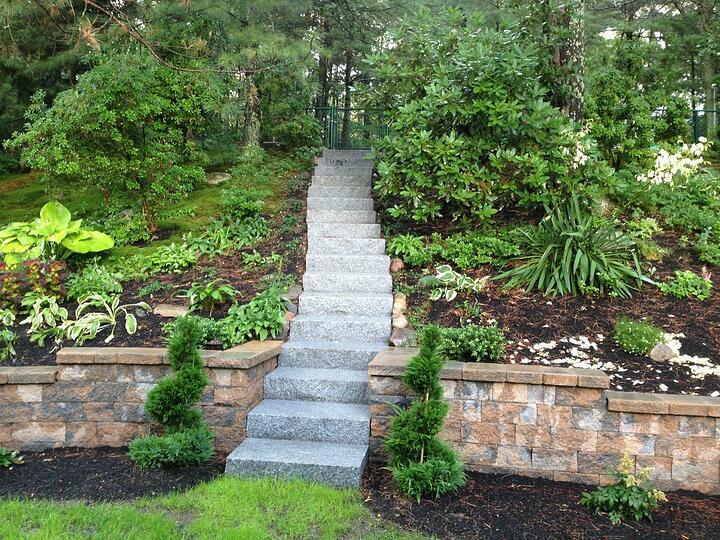 A bluestone walkway leads from the driveway to both sets of Woodbury Gray rock face steps. 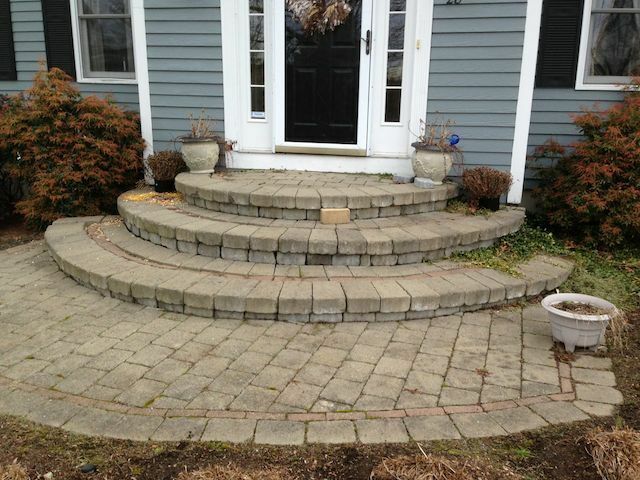 Simply put, the homeowners needed a better way to get from the driveway to the deck. They were using a large boulder as a way to step up to the backyard. 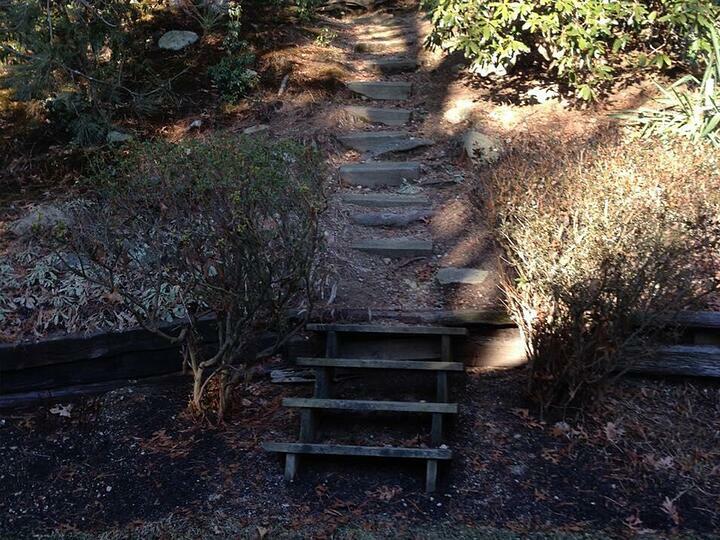 The new granite steps and a flagstone walkway are a much safer way to enter the yard. 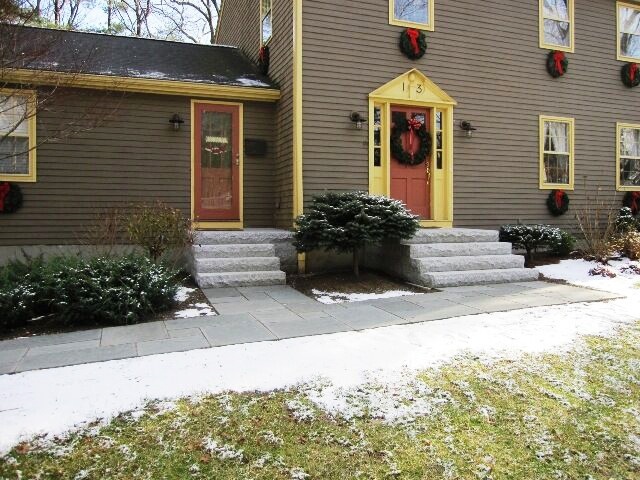 A set of Woodbury Gray granite steps begins at the gray cobblestones that line the driveway and curve around. Green Mountain Flagstone in between the steps create a walkway that blends with the natural surroundings.There was a 2 ½ foot drop-off from the boulder, so it was relocated. 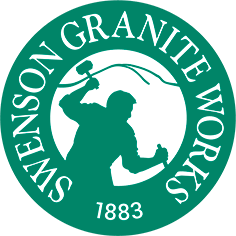 If your exterior has been transformed with products from Swenson Granite Works, here’s your chance to show it off and also enter to win a prize. Submit before and after photos of your outdoor residential or commercial project in our Before and After Challenge and be entered to win a $500 Swenson Granite Works gift card.